Reissues are nothing new. 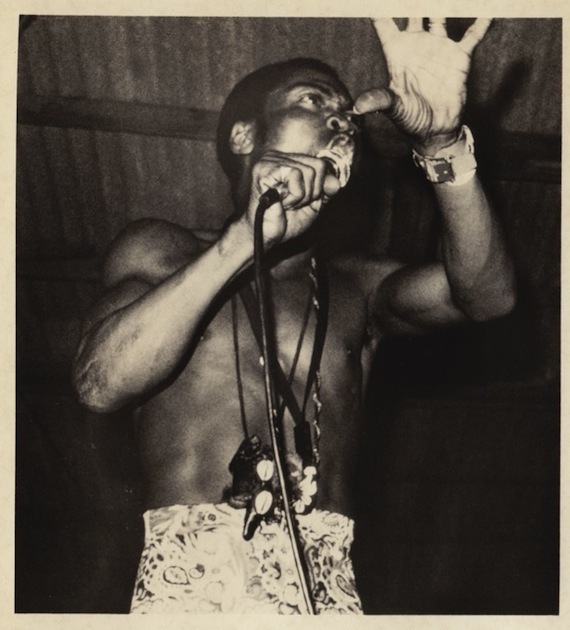 But last year, when news of the promise of the reissued Fela Kuti catalog surfaced, there was reason to get excited. The newly resurfaced Knitting Factory Records is responsible for the comprehensive catalog overhaul. Last week we caught up with label manager Brian Long to find out why. Interview after the jump. Aquarium Drunkard: Why the massive Fela overhaul? Why now? Brian Long: The Fela catalog was reverting back to the Kuti Estate. It just made sense to re-start Knitting Factory Records with the catalog and time the reissue campaign with the FELA! Broadway musical. AD: Tell me about the reissue process; when did you first get the idea begin the undertaking? Brian Long: The idea came up in Winter ’09. We are replicating the exact front/back covers of all the Fela album art and releasing the CDs in batches and in the chronology the original albums were released. AD: Do you see this seemingly renewed interest in Fela by the mainstream (the Jay-Z/Will Smith produced Broadway production, etc) as a gateway into Fela doing for afro-beat what Bob Marley did for reggae three decades ago? Brian Long: No question. There was a Fela resurgence in the late ’90s, following his death, which came from the club world. In the next decade his influence percolated into rap. It helped that his antiauthoritarian lifestyle only further legitimated his cred in the rap world. AD: The width and breath of the catalog is dense—it can be intimidating to newcomers., especially Western audiences. I imagine the release of the “best of,” Black President, was meant to ease new listeners in, yes? Brian Long: True. We also have issued a Deluxe version which includes a DVD with great footage from the ’70s/’80s and interviews to help give context to the Nigeria Fela came from. AD: How did the track selection process for the Black President happen. Everyone has personal favorites; any heated debates on what should and should not be included. Brian Long: It was compiled by some Fela-heads in France who worked in conjunction w/ his former managers. AD: How did you first personally encounter the Fela’s music? Brian Long: I was the Music Director at a College Radio station in the mid-’80s when we were sent Live in Amsterdam and Army Arrangement, which were released by Celluloid. Love at first listen. AD: What’s you favorite Fela album and why? Brian Long: It changes. Currently, I’m really feeling Confusion. It’s Fela’s most psychedelic. It begins w/ a long droney keyboard passage before rhythm and instrumentation builds. Then there is some wild reverb put on Fela’s vocals which give it an otherworldly feel. Access the Fela Kuti store here. Winter ’09 refers to the first few months of 2009. This is when KFR got into action to license the Catalog. The digital re-launch was August ’09. Our first batch of re-released CDs was in February ’10. The second batch was May 11. I hope this clarifies your confusion. Pingback: Hidden Track » Leftovers: East L.A. Does West L.A. I think the musical is great by the way. Excellent in fact. Sours though if seen as a long term marketing campaign to sell sell sell. Good to see the man in charge of the reissue has good taste. Confusion is my favorite Fela record too. The opening four minute keyboard/drums jam and the distorted vocals are fantastic, but what he doesn’t mention is that the outro which goes on for about the last four or five minutes is maybe the most jammin’ part of Fela’s entire catalog – if it doesn’t make you dance or at least move around in rhythm, nothing will.